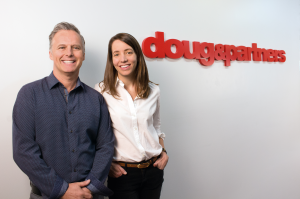 May 22, 2018 (Toronto) – Today, Doug Robinson, founder / CEO of doug&partners announced that the company is expanding its senior management team to include Caroline Kilgour as VP Managing Director. This is a new role at doug&partners, and reflects the ongoing growth and vision of the company to not just continually provide an exceptional partnership for existing clients, but to position the company for continued success as our industry evolves rapidly. Kilgour brings with her diverse brand experience ranging from Global Automotive and CPG brands, to some of Canada’s top homegrown brands, to a myriad of agile entrepreneurial ventures, including Volkswagen, Mars Wrigley, Royal Bank of Canada, Nestle, Porsche, Hudson’s Bay Historical Foundation, Subaru, Volvo, Intel, OLG and UPS. “I’m very excited about my new role at d&p. I feel a tremendous sense of opportunity here. The agency has a great history of award winning creative backed by a really strong client roster. There’s an exciting vision for the future which I’m really happy to be a part of and help shape.” says Kilgour. Caroline’s first day at doug&parnters is Tuesday, May 22.